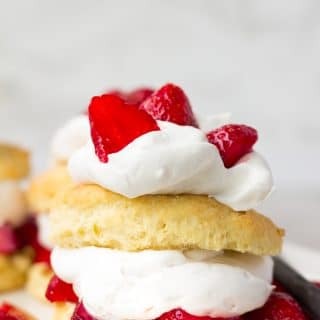 Easy Vegan Strawberry Shortcake with homemade biscuits, lightly sweetened strawberries and fluffy coconut whip in less than an hour. 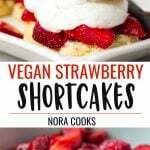 The strawberry season is upon us! These juicy red strawberries are abundant at the farmer’s market right now, and I even have a little strawberry patch in our backyard that is producing quite a lot this year. My 2 year old loves to wake up in the morning and go outside to pick a few strawberries. He’s so cute, he will even save a couple in the fridge for daddy or his brother/sister. I can hardly stand conventional strawberries anymore after tasting these beauties. They are almost a different food altogether! There is nothing like the deep redness and sweetness of a freshly grown strawberry. How do you make the biscuits for vegan strawberry shortcake? 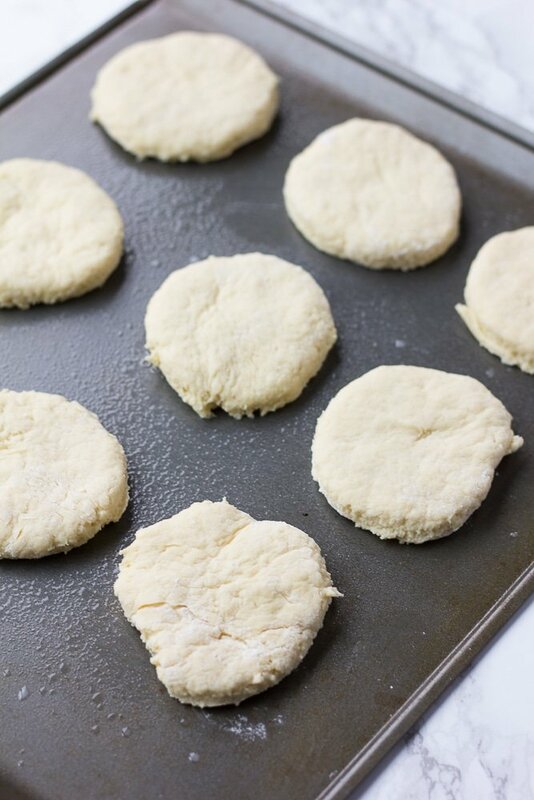 The biscuits are easy to make and are ready in under 30 minutes. It involves combining the flour, sugar, baking powder and salt in a bowl. Then cut cold vegan butter into squares and cut it into the dry using a pastry cutter (or your hands like I do!) until it’s fine and crumbly. Then pour in the ‘vegan buttermilk’, which is simply non-dairy milk and apple cider vinegar. Mix, cut into biscuits and bake for 15 minutes. Easy peasy. TIP: If you don’t have a biscuit cutter, you can use a round glass to cut them. What about the coconut whip? You can make your own using canned coconut milk (see instructions in the recipe below). 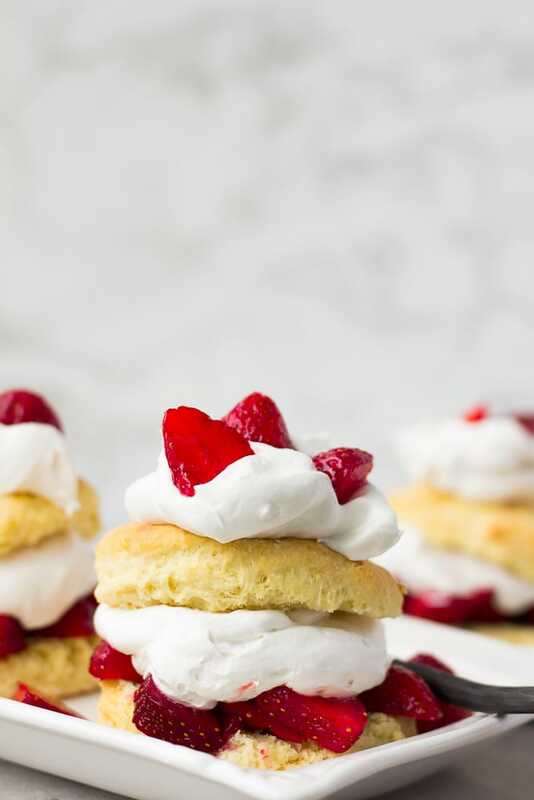 OR if you have a natural food store like Whole Foods nearby, they will probably have this So Delicious Cocowhip which makes this recipe even easier! Homemade tastes better, but this stuff is pretty dang delicious and totally vegan. 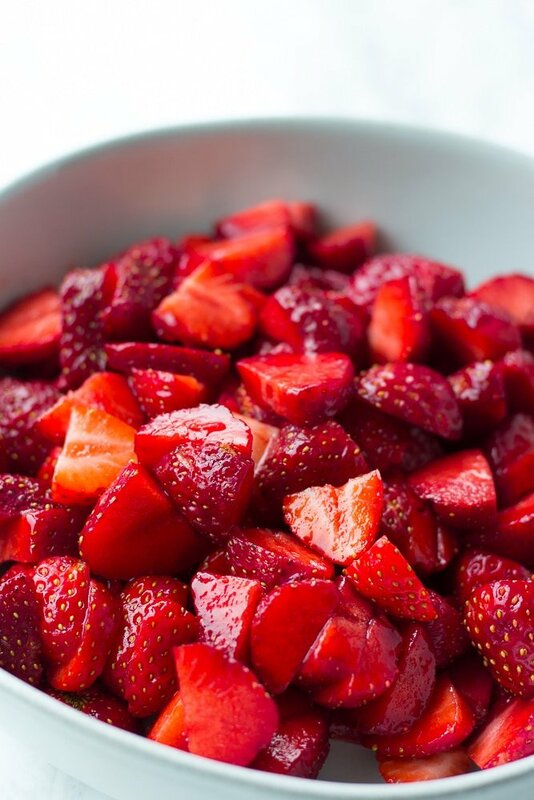 Prepare the strawberries: Stir the strawberries and sugar in a large bowl. Cover and set in the fridge until ready to use. Preheat the oven to 425 degrees F and lightly grease a baking sheet. Measure the 1 1/4 cup almond milk and add the tablespoon of apple cider vinegar to it, stir a little and set aside to curdle (this is your buttermilk). Mix the flour, sugar, baking powder and salt together in a large bowl. Add the cubed vegan butter and cut into the dry ingredients (may also use a food processor for this). 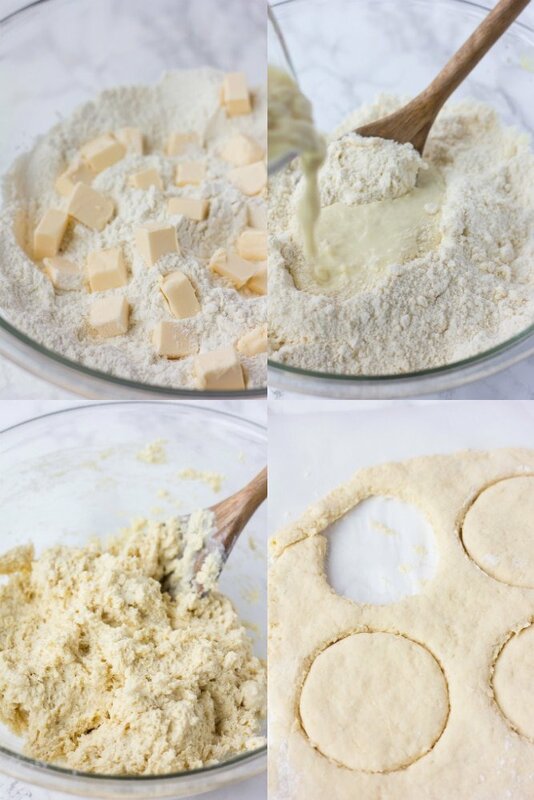 Use a pastry cutter or just your hands. It will look fine and crumbly. Pour the vegan buttermilk into the bowl, and stir until just combined. The dough will be quite sticky. Lightly flour a working surface (such as a clean countertop), and your hands and work the dough into a ball. Gently flatten to about 1/2 inch thick, then cut into circles using a biscuit cutter or even a rounded glass. You should have about 10 biscuits. Place on the pan and bake for about 15 minutes, until golden brown on top. Let cool for 10 minutes or so before assembling. Chill the canned coconut milk or cream overnight, being careful not to shake the cans so the cream will remain separate. Remove the cans, open and scoop out the hardened coconut cream, leaving the liquid in the can. Add to a large bowl, and beat with a mixer for a minute until creamy. Add vanilla and powdered sugar and beat until creamy, smooth and fluffy. Refrigerate until using so it doesn't melt! 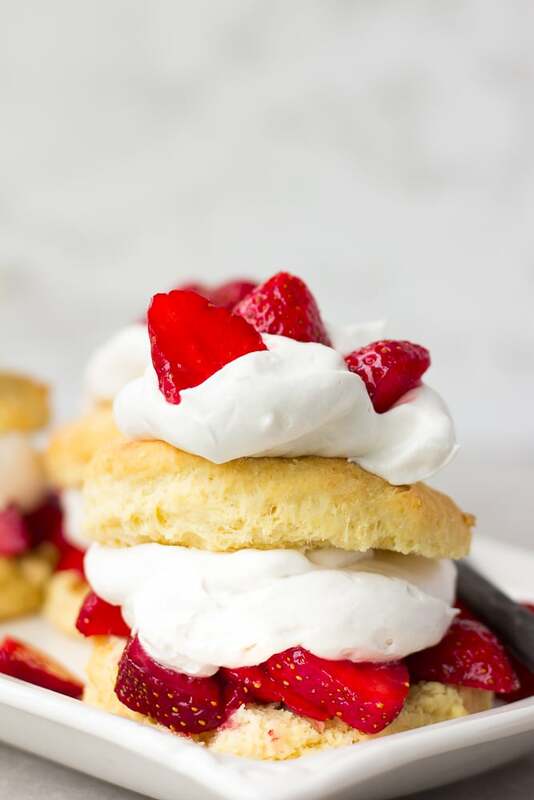 Slice the biscuits in half and layer with strawberries and coconut whip cream. Serve immediately and enjoy! For the coconut whip, I've found that Whole Foods 365 brand works well. If you can find coconut cream, you will get the most out of your cans. Sometimes I just buy So Delicious Cocowhip though and save myself the time and effort!